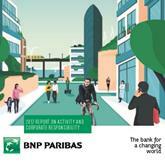 BNP Paribas’ Corporate Social Responsibility (CSR) approach allows the Group to take part in building a sustainable future, while ensuring the Group’s performance and continued stability. Since 2012 the CSR policy has been built on four pillars: economic, social, civic, and environmental responsibility. The BNP Paribas Group’s foundation in Germany was founded in 2015. It specifically supports children and young people who have to overcome hurdles and barriers in their own personal biography, for example as a result of social disadvantage, disability, a migration or refugee background.